Accent your ears with a beautiful and meaningful symbol of affection! 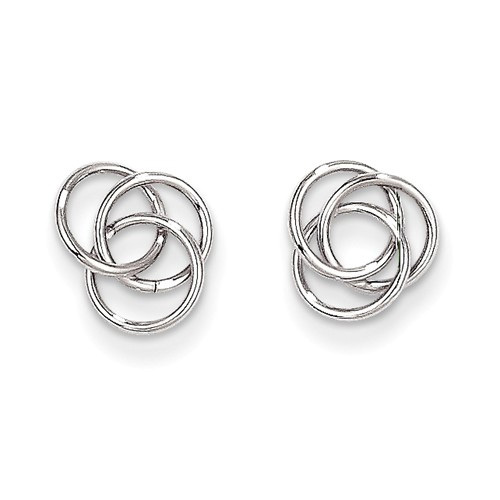 The love knots in these earrings represent the way in which two lives are woven together in endless unity. Inspired by a centuries-old Celtic knot design, these motifs create a sophisticated design from three interlocking loops that are forever joined in one timelessly beautiful design. Having no beginning or end, these knots are a perfect picture of love that never ends and that can never be pulled apart. Crafted from shining 14K white gold, these earrings add elegance to any day, as well as serve as continual reminders of any special relationship. Earrings measure 8mm and come with standard push back posts. We guarantee our 14K White Gold Trinity Knot Earrings to be high quality, authentic jewelry, as described above.